Calling all dinosaur experts! We need your help. We've just received a crate of dinosaur fossils - and they need assembling! Fast! Can you find the right room for each skeleton and build them in time for the museum's big opening? There are five pop-up dinosaurs to put back together, including a Triceratops, Stegosaurus and T-rex. 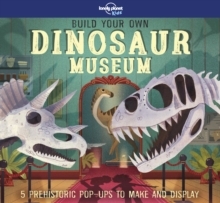 It's going to be roarsome!Lonely Planet's Build Your Own Dinosaur Museum is an activity book with a difference, where you get to play chief palaeontologist. The museum rooms are ready, but there aren't any skeletons to display. It's up to you to figure out which one is which and where they need to go. Fun, interactive and with lots of facts to discover, this book is perfect for any dinosaur fan, budding biologist or model maker. About Lonely Planet Kids: Lonely Planet Kids - an imprint of the world's leading travel authority Lonely Planet - published its first book in 2011. Over the past 45 years, Lonely Planet has grown a dedicated global community of travellers, many of whom are now sharing a passion for exploration with their children. Lonely Planet Kids educates and encourages young readers at home and in school to learn about the world with engaging books on culture, sociology, geography, nature, history, space and more. We want to inspire the next generation of global citizens and help kids and their parents to approach life in a way that makes every day an adventure.